Tumbled Chrysocolla healing gemstone with beautiful swirls of color. If I were only allowed to carry one gem, Chrysocolla would be it! Current stock is a LARGE size. Some are sphere shaped at 1-1/4", some ovals, and weigh in from 1.3 to 1.5 oz. each. Their coloring is just gorgeous! Chrysocolla can calm the Base, Sacral and Solar Plexus Chakras. It can ease emotional heartache at the Heart Chakra and provide renewed strength, balance and a capacity to love. Used at the Throat Chakra, it provides strength and balance in how we express ourselves and communicate. Used at the Brow Chakra, it can initiate powerful visionary experiences. Chrysocolla is an awesome, multi-purposed stone. It covers the 1st, 2nd, 3rd, 4th, 5th and 6th Chakras! Chrysocolla has a monoclinic cystal system and is in the mineral class of ring silicates. It is formed by a secondary process in the oxidation zone of copper ore where surface water that contains silicic acid dissolves the copper out of the rock. Because Malachite is formed in the same type of manner, it is not uncommon to find the two joined together. It can crystalize in the form of crusts, layers, large masses and even needle-like crystals. It's coloring can range from green to turquoise to blue shades, and is sometimes found with brown or black splotches. It can be found in the southwestern U.S., Mexico, Zaire, Russia, Peru and Afganistan. As with most gemstones, Chrysocolla is best used when held or laid upon the body. Best results come when it is laid directly on a Chakra, but it is quite beneficial however you choose to use or carry it. 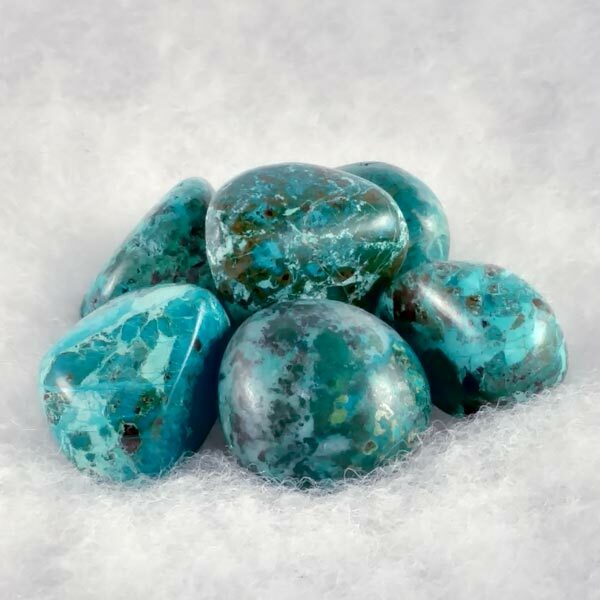 Chrysocolla will encourage a self-awareness and balanced nature. It is a great aid in accepting the constant changes in life and will assist us in going through the ups and downs and still be able to pursue our goals. Chrysocolla can provide stamina and drive in cases of laziness, but also provides a calming effect if nervous or irritable by promoting harmony. It can allow the release of distress from negative emotions and promote the understanding of others. 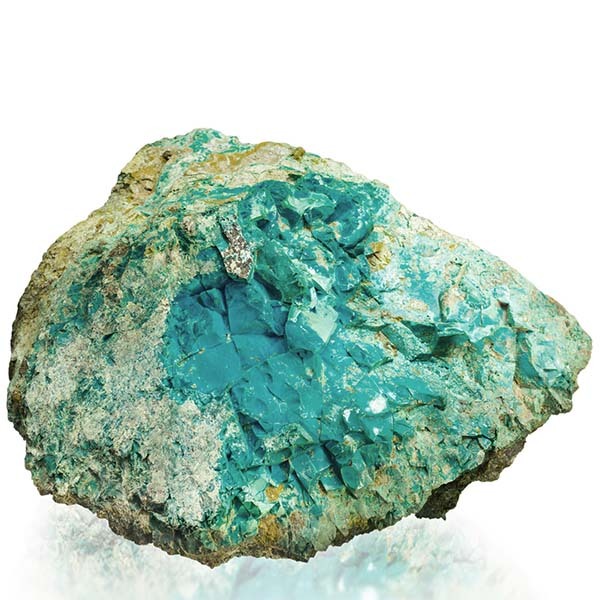 Chrysocolla encourages us to be neutral, have clarity and to keep a cool head. It also helps us to recognize that there is more to life than material things. It allows us to forgive old hurts and disappointments, which then clears the way for new, healthy ways of thinking. Chrysocolla helps with infections, especially in the throat area. It can detoxify and fortify the liver functions, has a cooling effect, can lower blood pressure and speed up the healing of burns. It can also help to regulate stress related digestive problems and thyroid gland functioning. How does it do all these things? It releases the cells that hold on to sickness, which clears the way for healthy new cells to regenerate tissue and organs. Chrysocolla has a special affinity with the signs of Gemini, Virgo and Taurus, but benefits all signs. It has a Receptive Energy, its Planet is Venus and its Element is Water. Chrysocolla has been used as a healing stone by Native American Indians for quite some time. It has also been used by musicians for its healing properties for the throat and lungs, and has been used or worn doing spells to attract love. My first piece was gifted to me by a Hopi medicine man when I was eighteen, along with a tiny piece of Amethyst. He told me it was all I needed to discover my true path in this life and to be at peace with myself. I can still remember thinking- "yeah right, rocks" (and I probably rolled my eyes). Many moons and years later I still have his gifts ... he was soooo right.